Since we here at BSB aren’t really able to catch Pack games, I reached out to Ricky Milliner. Ricky is a season ticket holder and blogger for the Pack. He’s a great follow on Twitter if you’re looking for real time updates on the Pack. I had a bunch of questions, and Ricky was very helpful and incredibly detailed in his replies. We went through Part One on Thursday, and here is Part Two. 4. Tim Gettinger got a call earlier this season, which was a surprise. Why him over someone like Ville Meskanen? Tim Gettinger was the best rookie in Hartford in the first half of the season. He was impressive right off the bat. The tall forward used his body well, getting the greasy goals in front of the net, screening, and getting the secondary opportunities. In the defensive end, he attempted to keep opponents away from the goalie crease. He may not have done his job in moments, but he was learning and developing. Gettinger knew he had the size and was not afraid to utilize that strength on either end of the ice. He got in the dirty areas and did get in plays that involved board play. Meskanen showed less at that time. 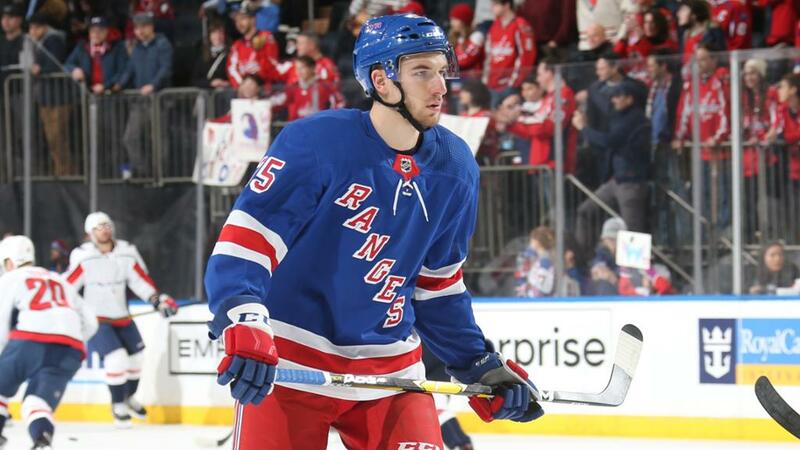 He did produce points, but he was not as ready as Gettinger when the Rangers were looking for a call up. Meskanen was developing steadily and not as rapid as Gettinger. He often had more mistakes, but was expected as both guys are rookies. At that time, Gettinger had the edge over Meskanen and other forwards in Hartford. However, Gettinger took on too much. His first fight in mid-November was not pretty. He left the game with a concussion and was out for a bit. Since then, the forward has been slow getting back to where he was at. Now he is doing less on ice but is trying. Meskanen now surpasses him in development. Meskanen has increased his offensive awareness, generated some nifty plays every so often and has more style to his play. His speed seemed to increase a bit as well. 5. It’s expected the Rangers are going to be calling up a few players after the trade deadline. Who do you think deserves the call up? Who do you think actually gets the call up? When the time comes for call ups after trade deadline, there are a few names I would love to see up. I agree with the youth movement the Rangers are attempting to do. I would choose John Gilmour, Ville Meskanen, Chris Bigras, and Lias Andersson. Each has contributed to Hartford’s season positively. The amount of contribution does not matter, but what they exactly provided. The rebuild is on, so why not give the prospects more experience with the NHL. Who will actually get the call up will be different. I would go with Vinni Lettieri, Matt Beleskey, Andersson, and Ryan Lindgren (assuming he isn’t recalled after the long break). Beleskey is a good depth forward for New York. His play in Hartford has been strong for a veteran. Lettieri, Andersson, and Lindgren are high ceiling prospects that could get good experiences in New York with David Quinn. We are all about development, exposure, and growth. 6. How has Matt Beleskey been? We always rave about how Wade Redden took on a key leadership role following his demotion, is Beleskey taking that same role? Matt Beleskey fits well with Hartford. He is a veteran that provides energy or grit with the Pack. I also enjoy how he protects the prospects when it comes to post-whistle issues with opponents. He immediately responds to any scrums, or players that instigate with the prospects. He is not afraid to step up when we need him. In other aspects, the veteran has provided a good example of leadership as well. He attempts to get the group going and has talked periodically with the forwards. He is approachable to the players. He has taken his time with Hartford as a positive role. The attitude he has is he’s there to teach and this is not a demotion. Wade Redden hands down was the best leader for the Wolf Pack when he was here. No one will come close as him. He was ready to be a leader and a teacher on the first day of the job, literally. The difference with Redden and other veterans we had in Hartford is the previous experiences. Redden was in the NHL for 13 seasons. He went through plenty of experiences to help guide the Ranger prospects at the time. The veterans today will not carry as much as him, considering some had brief NHL time or became established only in the AHL. I have had fond memories of Redden. In public he was one of the players to interact with and did give back in the community. I recall a time where he bought the whole team iPods (I believe what the gift was, going off memory) as a gift. He truly cared about the city of Hartford and the players in the locker room. 7. Will the Pack ever be good again? This is a loaded question…. Where should I begin? In the foreseeable future, they should be better at some point. The question is when? The Rangers are loading up on their draft picks, which is into developing prospects. The farm system was wiped cleaned for a good portion of previous seasons. The Wolf Pack missed the playoffs in the last 5 of 6 seasons and the last 6 of 9 seasons. The Pack in their earlier times made the playoffs every season, from 1997-98 to 2008-09. The sudden shift in the franchise was due to management by the Rangers. At the time of getting players for the now, trading away picks and prospects was not going to be felt by New York. Instead, it was slowly making the Wolf Pack weaker. That’s where we are at now. The only reason Hartford made the playoffs in 2014-15 is because the signing of juggernaut veterans to fill in voids of the roster since there weren’t many prospects in the system. The Pack is considered weak in today’s AHL. Back in earlier times, teams were scared to play Hartford. This is not the case anymore. The AHL has changed and the Rangers were unable to keep up. You must have prospects and the right veterans to create a successful team. You want that wining culture to develop, not a losing culture. Hartford has a losing culture, which negatively impacts development. Teams who were terrible are now good. Hartford has been in the bottom. This becomes an issue for free agency. AHL forwards are not picking the Pack anymore. These players want a winning roster with management that knows how to operate the club from a player’s perspective. There are three types of players in the AHL- prospects, AHL veterans, and ECHL players who want to stick in the AHL. The AHL veterans are a critical piece for development in today’s game. Not able to attract the right veterans will also harm development of prospects. It is frustrating to see a “bad product” on ice annually, but there are many reasons why Hartford struggles. Running a strong AHL team will benefit your parent club down the road. Generally, teams who won the Stanley Cup have had a strong AHL core. "Wolf Pack Q&A With Ricky Milliner (Part 2)", 4 out of 5 based on 6 ratings. Years of neglect created the problems of today on the farm. At least we recognize the issue, and are trying to address it…..I hate to repeat myself, but for years the Pens always had a kid, or two who came up from Wilkes-Barre, and made an impact during the PO’s. Connor Sheary, Geitzel are examples of what I’m talking about. By the way, AHL games are fun to watch, and are cheap enough to take a few of the kids at a time to see them play. When my daughter’s sons are here, the four of us enjoy the Hershey Bears games, especially when the Pack is in town!!!!!! Make sure you stop at Troegs right next door!